So Uatu, the Watcher, is watching (?) the wedding. This is when we see Kitty Pryde and Nightcrawler. What if Scott Summers and Jean Grey had married earlier? What if Scott Summers and Jean Grey had never fallen in love at all? What if Phoenix had fallen for Wolverine? Kitty doesn’t show up in any of these, just the framing device. But it is a What If so none of them end well. Good thing they got married when they did! Kitty tells Storm that is she excited about filming every part of the ceremony. 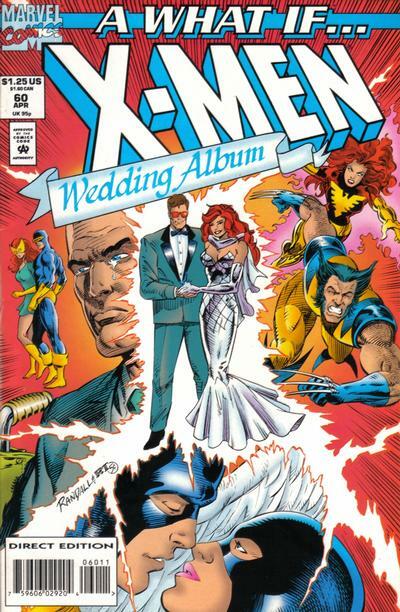 In the X-Men : Wedding Album, that we are reviewing tomorrow, we see that Kitty does just that. Now, that’s good synergy! One of the few What Ifs that deals with the actual Proper Marvel Universe and it really works. 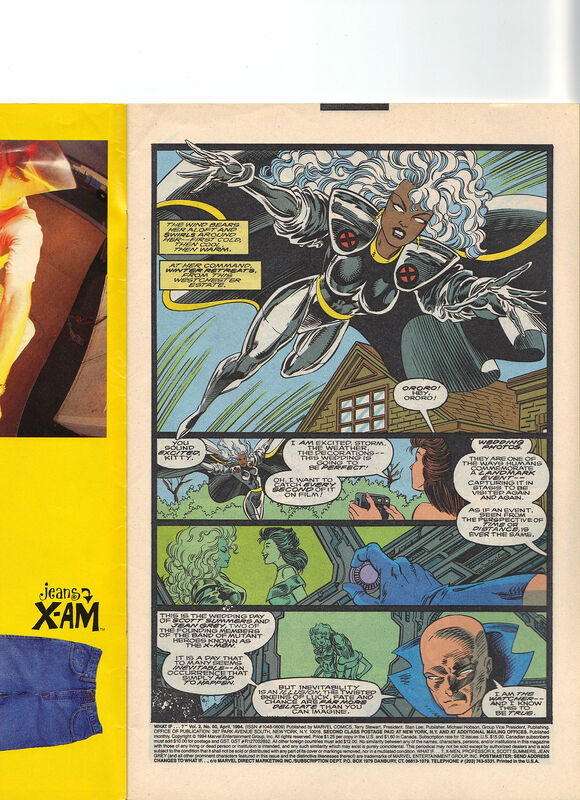 Of course, it is written by Kurt Busiek, one of my all time favorite comic book writers, so that makes sense. I wish I had more opportunities to keep more of his comics in my collection but he’s always been more of an Avengers guy than an X-Men gentleman. Uatu, the Watcher, wonders at the end what the future holds for the newlyweds. Happiness or struggle? Reward or suffering? Mostly happiness and a little suffering from time to time. Jean sees Scott die via merging with Apocalypse … he gets better and Scott sees Xorn/Magneto kill Jean, which she remains dead from – and he gets to bounce from her to Emma Frost, so I guess he wins in the end. Their marriage was already falling apart by that time though.